Using the NASA/ESA Hubble Space Telescope, astronomers from the Max Planck Institute for Astronomy in Heidelberg and the University of Cologne have completed a high precision study of one of the most massive young star clusters in the Milky Way. To this end, the scientific researchers compared two observations that were made ten years apart. Their unexpected findings: the members of the cluster are in no stable state of balance and have not yet "settled down". Open stellar clusters such as the famous Pleiades will be held together forever: in the course of dozens of millions of years their different stars will disperse. Very massive and compact clusters are different. In the long term, this can lead to the development of massive aggregations of globular clusters, whose tightly-packed stars remain gravitationally bound to each other for billions of years. With a mass of more than 10,000 suns packed into a volume with a diameter of a mere three light-years, the massive young star cluster in the giant nebula NGC 3603 is one of the most compact stellar clusters in the Milky Way. For comparison, in our immediate cosmic neighbourhood, there is only one single star of the same volume as the Sun. Could this massive open stellar cluster be a globular cluster in the making? In order to unravel this question, a team of astronomers led by Wolfgang Brandner from the Max Planck Institute for Astronomy, Heidelberg, MPIA, tracked the movement of hundreds of the cluster's stars. Such a study can reveal whether the stars were in the process of drifting apart, or about to settle down, i.e. to achieve a long-term, stable state of balance. What is more, the measurements also serve to distinguish members of the star cluster from unrelated stars that, as viewed from Earth, just happen to fall along the same light of sight. Measurements of this kind are difficult. Imagine a star moving sideways at a rate of a few kilometres per second, viewed from a distance of 20,000 light-years - the actual distance of NGC 3603 from Earth - such a star's position on the night sky would shift by no more than a few billionths of an angular degree per year, at the limit of the capability of today's most precise observation methods and instruments. By using two observations, made ten years apart with the same camera aboard the Hubble Space Telescope, and by performing an intricate analysis to account for all possible disturbances, Brandner and his team were able to reach the required accuracy. All in all, the astronomers observed more than 800 stars. 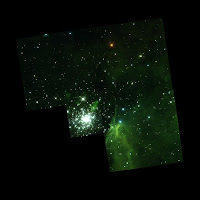 About 50 of these were identified as foreground stars, which are unrelated to the cluster. From the remaining sample of more than 700 - a quite varied selection in terms of different masses and surface temperatures - the astronomers were able to obtain sufficiently precise speed measurements for 234 cluster stars. Boyke Rochau (MPIA), the paper's lead author, who performed the data analysis as part of his PhD work, explains: "Once our analysis was completed, we reached a precision of 27 millionths of an arc second per year. Imagine you are in Bremen, observing an object that is located in Vienna. Now the object moves sideways by the breadth of a human hair. That's a change in apparent position of about 27 millionths of an arc second." The results for the motion of these cluster stars were surprising. According to widely accepted models, which reproduce what is actually observed in older globular clusters, the average stellar speed in a cluster like the one in NGC 3603 should depend on mass. Stars with lower mass should move faster, and those with higher mass should move more slowly. The stars for which precision measurements were possible represent a range of masses between 2 and 9 times that of the Sun. Yet their average speed does not appear to vary with mass at all, with all of them moving at about the same average speed of 4.5 km/s. Apparently this very massive star cluster has not yet settled down. Instead, the stars' velocities still reflect conditions from the time the cluster was formed, approximately one million years ago. The intriguing question of whether or not the massive young cluster in NGC 3603 will become a globular cluster remains open. Given the new results, it all depends on the speeds of the low-mass stars, which were too faint to allow for precise speed measurements with the Hubble Space Telescope. Wolfgang Brandner says: "To find out whether or not our star cluster will disperse, we will need to wait for the next generation of telescopes, such as the James Webb Space Telescope or the European Extremely Large Telescope of the European Southern Observatory."